To meet this need, non-invasive imaging technologies based on nanoparticles (NPs) have been developed to replace the traditional invasive histological analysis.6-14 Initially being produced in research laboratories, NPs have been undergoing fast commercialization and become standardized products in the recent years.16 Given the reasonable cost, easy accessibility, and the non-invasiveness, fluorescent imaging, magnetic resonance imaging (MRI), and photoacoustic imaging are currently the most favorable imaging modalities for the application of cell tracking. This trend of using commercially available NPs should allow the standardization of the procedure in the labeling and tracking of cells, which will improve the repeatability and adherence to the requirements of safety regulatory body. In this review, after a brief discussion of the common imaging modalities used in stem cell tracking, we summarize the commercially available NPs, which have been or could potentially be used for the labeling and tracking of stem cells. Specifically, we focus on those NPs that act as contrast agents for fluorescent imaging, MRI, or photoacoustic imaging. Finally, we also discuss the concerns of existing NP products and the future of development of new NP products for stem cell tracking. Commonly used imaging modalities for stem cells tracking with NPs include fluorescence imaging, magnetic resonance imaging (MRI), photoacoustic imaging and nuclear imaging using radioactive isotopes. MRI is a fast, non-invasive, deep tissue penetrating technique3, 22 which provides good contrast between the different soft tissues of the body, and reconstructs 2D or 3D images of the tissues. NPs improve the sensitivity and detectability of the objects in MRI through shortening the T1/T1* or T2/T2* relaxation time22, which further advances the use of the MRI technique in cell imaging and tracking. Positron emission tomography (PET) and single-photo emission computed tomography (SPECT) are nuclear imaging techniques utilizing radioactive isotopes. PET and SPECT collect gamma rays to reconstruct 3D images of the samples. Both techniques are suitable for deep tissue imaging and can provide assessment of cell viability or function.3 However, radioactive isotopes usually have short half-lives, which limit their applications in long term imaging and cell tracking.3 Furthermore, the accessibility of isotopes and the safety issue have restricted their applications. NPs for PET or SPECT are usually pre-synthesized polymer NPs (e.g latex beads 28), inorganic NPs (e.g. quantum dots (QDs) 29, magnetite NPs 30, gold NPs 31) or lipid NP 32 chelating radioactive isotopes. There are currently no commercial NPs labeled with radioactive isotopes. Fluorescence imaging provides high sensitivity, high resolution, and possibility to monitor biological phenomena in real time 3,33 They are also attractive in terms of cost, accessibility, and visualization. Thus fluorescence imaging is the most widely used modality in tracking stem cells. Fluorescent NP products on the market are mainly fluorescent polymer NP, quantum dots and fluorescent silica NPs. Polymer NPs are generally prepared through the dispersion of preformed polymers or polymerization of monomers.34 A number of techniques within the scope include solvent evaporation, salting-out, dialysis, supercritical fluid technology, emulsion, surfactant-free emulsion, and interfacial polymerization. To become fluorescent, organic dyes could be either physically entrapped in the polymer interior during the preparation of NPs or covalently bound to the polymer chain before the preparation of NPs.35 Fluorescent polymer NPs can be examined with an epi-fluorescence microscope, confocal microscope, fluorometer, fluorescence spectrophotometer, or fluorescence activated cell sorter. Commercial products of fluorescent polymer NPs. In one example of polymer NPs used in stem cell tracking, Fluosphere® conjugated to Nile Red was used to assess the recruitment, and vasculogenesis, that is, homing and vascular channel formation by circulating stem/progenitor cells (SPCs) in subcutaneous Matrigel, an endothelial cell basement membrane-like material that is a liquid at 0°C and a solid at body temperature,45 supplemented with lactate polymer in mice.46 Matrigel plugs were injected subcutaneously into the back of mice on either side of the thoracic vertebrae. The presence of functional vascular channels in the Matrigel was documented by injecting mice with 40nm carboxylate-modified Fluosphere® (Invitrogen) conjugated to Nile red. 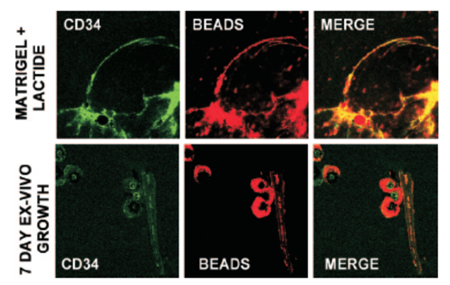 Results showed that SPCs were among the earliest cells to arrive at a subcutaneous Matrigel target and were recruited to Matrigel in a large cell number.46 (Figure 1). However, the reports of using fluorescent polymer NPs in direct labeling and tracking stem cells are few. Fluosphere® and Fluoresbrite® are the more frequently used in phagocytosis assessment of phagocytic cells, such as dendritic cells,47, 48 monocytes,51 neutrophils,50 macrophages,51 differentiated from stem cells from different origins. Quantum dots (QDs) are colloidal, crystalline seminconductor NPs made from II-VI or III-V elements (e.g. PdS, CdSe).23 Their electronic and optical characteristics are closely related to the size and shape of the individual crystals. In general, smaller sized QDs have shorter emission wavelength.52 QDs have unique absorption and emission properties that differentiate them from conventional fluorescent dye molecules. Specifically, QDs have broad absorption range from ultraviolet (UV) to visible, but exhibit distinct emission spectrum with narrow full width at half maximum (FWHM) (typically 10-40nm).53 QDs are more resistant (can be up to 100 times) to photochemical degradation than fluorescent dyes, which makes them useful for tracking cells and monitoring biological changes over extended periods of time.54 Despite many advantages, QDs have inherent problems. QDs generally contain heavy metal ions such as Cd2+, Pd2+, Se2+, which are toxic.60 Stochastic blinking has also been observed for QDs. The involvement of dark states and blinking phenomena in QDs requires higher doses in order to yield the desired brightness and to increase the accuracy of quantitative measurements in cell tracking, cell imaging or other biological applications.55 However, higher doses may decrease signal to noise ratio and increase non-specific binding. Currently, QDs are distributed by many large companies like Invitrogen, Millipore, eBioscience, Thermo Fisher, Sigma-Aldrich, Millipore, and Nanoco Technologies. Small vendors exist as well including Ocean Nanotech, Crystalplex, Nanoaxis etc. Amongst the numerous QD products, Qdot® (Invitrogen) is most frequently used for stem cell labeling and tracking, seconded by efluor® (eBioscience). 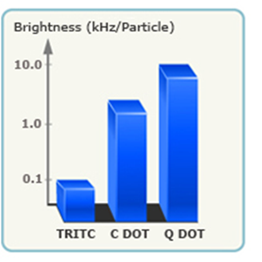 Nanoco Technologies claims it is the only supplier of heavy metal-free quantum dots CFQD™ (cadmium-free quantum dots) which show bright emission from UV through the visible spectrum, and into the near infra-red.56 All existing QDs products are expensive ($150-$300 per micro molar). Thus it is necessary to improve the reaction methods to significantly reduce the cost of QDs and develop green chemistry to produce non-toxic QDs in order to satisfy the growing market need. Table 2 summarizes existing QD products from several major distributors. Many have reported tracking of QDs labeled stem cells in vitro and in vivo. For example, Slotkin et al developed an ultrasound-guided in vivo delivery technique to efficiently label neural stem and progenitor cells (NSPCS) of the developing mammalian central nervous system with COOH-conjugated Qdot® 620.57 In their study, COOH-conjugated Qdot® 620 were injected into the parenchyma of the caudal ganglionic eminence (CGE) of the ventral telencephalon of E13.5 mouse embryos (Figure 2A). After 5 days, Qdot®s were found in each of the three principle cell types differentiated by NSPCS, including GFAP+ astrocytes, NG2+ oligodendrocyte progenitors and βIII tubulin+ neurons (Figure 2B-D). Those three principle types of cells were found substantial distances away from the initial site of injection, which indicated that Qdot® labeled NSPCS in vivo differentiated and migrated during the period studied. Commercial products of QDs from major distributors. Qdot® forneural stem and progenitor cells (NSPC) tracking in the developing mammalian central nervous system. A:Qdot® 620 were injected into the caudal ganglionic eminence of embryonic E13.5 mouse brains with the aid of high-resolution ultrasound biomicroscopy. B-D: In a coronal view of E18.5 developing cerebral cortex, intracellular labeling by Qdot® 620 was observed in NG2+oligodendrocytes (B), GFAP+ astrocytes (C), and βIII-tubulin+ neurons (D). (Reprinted and adapted with permission from John Wiley and Sons, reference 57). Fluorescent silica NPs from HST and Microsphere-Nanosphere. Besides fluorescent polymer NPs and QDs, another type of fluorescent NP is silica NP containing organic dye molecules. In this system, silica acts as matrix to chemically and mechanically stabilize the fluorescent dyes. The silica partially protects the dye molecules from external quenchers, enhances the photostability of incorporated dyes, and in some cases, provides a biocompatible and easy-to-functionalize surface for bioconjugation.24 Fluorescent silica NPs are mainly made through two approaches: sol-gel or reverse microemulsion. Sol-gel method usually generates fluorescent silica NPs in the hundreds of nanometers to micron range,58 while reverse micro-emulsion strategy provides NPs with diameters from nano to micro size.60, 61, 62 And in both methods, the spectral character of silica NPs is determined by the dye molecules encapsulated. 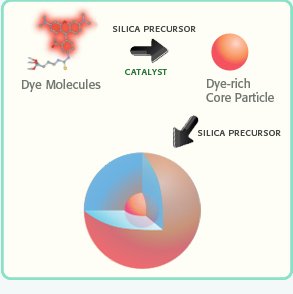 Schematic illustration of the synthesis of a C•spec® NP: the organic dye molecules are covalently bound into a silica-based core. Then the core is grown into a core-shell NP (Reprinted and adapted with Permission from HST, Reference 65). Brightness measurements (log scale) of C•spec® NPs relative to constituent dye (TRITC) showing the brightness enhancement, as well as a comparison to QDs of similar size and wavelength. (Reprinted and adapted with permission from HST, Reference 65). Compared with fluorescent polymer NPs and QDs, fluorescent silica NPs are advantageous in terms of their surface functionalities and biocompatibility. Commercial fluorescent polymer NPs are usually available with carboxylic acid, sulfate, aldehyde, and amine surface functionalities. C•spec® includes broader selections of surface functionalities, such as NHS ester, carboxyl, amine, sulfhydryl, maleimide, streptavidin, polyethylene glycol (PEG), polyethylenimine (PEI), cyclic arginylglycylaspartic acid (RGD), transactivator of transcription (TAT) peptide, primary antibody and secondary antibody. Furthermore, fluorescent silica NPs are presently the only type of fluorescent NP approved for human clinical trials. In January 2011, 7nm Cy5 encapsulated fluorescent silica NP was approved for Investigational New Drug Application (IND) from the US Food and Drug Administration (FDA) as an ultra small silica inorganic NP platform for targeted molecular imaging of cancer. Considering the growing demand from the field of stem cell labeling and tracking in clinical trials (940 clinical trials involving stem cells are funded by U.S national institute of health from 2002 to 2007. The number of funded stem cell clinical trials increased almost three fold to 2780 cases from 2007 to 2012),116 silica-based fluorescent NPs like C•spec® have great potential to help advance our understanding and management of stem cell based research and therapy. Magnetic NPs could be categorized as T1 or T2 contrast agents for MRI depending on the relaxation processes. T2 contrast agents include superparamagnetic iron oxide NPs (SPION), bimetallic ferrite NPs (e.g. CoFe2O4, MnFe2O4, and NiFe2O4), and hybrid magnetic NPs such as Fe3O4-Au dumbbell NPs.70 So far, SPIOs are the only commercial NPs that have been regulated for clinical applications.73 Other types of magnetic NPs are still in the experimental stages and only produced at the lab scale. T1 contrast agents are primarily gadolinium (Gd) containing NPs (e.g.Gd-chelated lipid NPs, Gd-chelated dextran NPs) and gadolinium oxide NPs.70 Considering the stability, biocompatibility, and accessibility, SPIOs and gadolinium oxide NP are the most popular choices for T2 and T1 MRI based stem cell labeling and tracking respectively. Guerbet, AMAG Pharmaceuticals and Bayer Schering Pharma AG are the major players in this field. Besides those big pharmaceutical companies, many chemical companies also supply SPIO products with different size ranges, coatings and surface functionalities. Table 4 includes a list of existing SPIO NP products. The products listed in upper part of Table 4 are supplied by pharmaceutical companies, and are FDA approved or under clinical trials. The products listed in the bottom part of Table 4 are SPIO products from chemical suppliers. (A) Schematic illustration of the 124I-cRGDY-PEG-ylated core-shellsilica NP with surface-bearing radiolabels and peptides and core-containing reactive dye molecules (insets). (B) Representative whole-body coronal micro PET images at 24-hours demonstrating M21 (left, arrow)) tumor uptakes of 3.6 %ID/g. %ID/g indicates the percentage of the injected dose (ID)of PEG-silica NP per gram tissue.and(C) enhanced M21 tumor contrast at 24 hours (right). (D) Whole-body fluorescence image of the tumor site 10 minutes after subdermal PEG-silica nanoparticle injection. (E) Delayed whole-body fluorescence image of the tumor site 1 hour after PEG-silica NPinjection. (Reprinted and Adapted with permission from ASCI, reference 69). a. Hydrodynamic size. b. all used brandnames of the same compound are listed. c. TEM size. d. Feridex® was discontinued byGuerbet, AMAG Pharm, Inc in 2009 because it competed with other MRI contrast agents sold by Guerbet, AMAG Pharm, Inc.
MRI of transplanted Resovist®-labeled NSCs in the rat brain. At 1 hour following transplantation of Resovist®-labeled NSCs (T2 fast-gradient echo sequence), arrows reveal two symmetrical and horizontal pinholes (left). At 2 weeks post-transplantation, the arrow reveals the migration of Resovist®-labeled NSCs from the right lateral ventricle to the ischemic area (right). (Reprinted and adapted with permission from NRR, reference 87). Survey of publications related to “superparamagnetic iron oxide nanoparticle in stem cell research” in the Web of Science database as a function of publication years (3 years as a data point) for the indicated combination of words in the title and/or abstract. 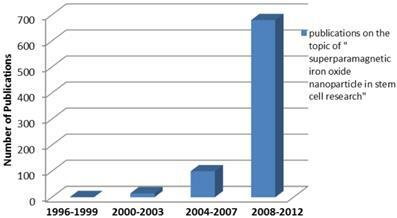 The number of publications shows the rapid increasing interest in stem cell and particle tracking in the literature. In other words, the trend of increasing number of publications indicates a rising “market share” of superparamagnetic iron oxide in stem cell related research. Different from T2 agents that produce negative signal (dark spots) on MRI images, Gadolinium based T1 agents produce bright positive signal. As they are bigger compared with conventional Gadolinium chelates, gadolinium oxide NPs should permit higher cell uptake and longer retention in labeled cells.89 Currently, the use of gadolinium oxide NPs in cell tracking is still at early stage due to the insufficient understanding of their stability in cells and their cytotoxicity on cell functionality.3 GadoCellTrack™ is the only commercial gadolinium oxide NP in the market. Developed by BioPAL Inc, GadoCelltrack™ is a negatively charged 50nm Gd2O3 NP for tracking cells in vivo by MRI. According to BioPAL, this reagent provides a strong T1 signal that is comparable to the same molar concentration as Gd-DTPA.90 GadoCelltrack™ has been used to label human aortic endothelial cells and the T1 enhancement of the internalized NP maintained for up to 7 days.91,92 We must notice that cell viability and proliferation could be affected with GadoCelltrack ™ labeling. Prior to apply gadolinium NPs in stem cell therapy, their effects on stem cell function needs to be fully investigated. Currently, Au NPs and Au nanorods can be purchased from Sigma-Aldrich, Strem Chemicals and Ted Pella as well as small companies specialized in NP products like Nanopartz, ocean nanotech, and nanocomposix etc (Table 5). Among those products, Accurate™ (Nanopartz), NanoXact™ (Nanocomposix), Biopure™ (Nanocompsix) and water soluble Au NPs (Ocean nanotech) are available from sub-10 to 125nm with peak surface Plasmon Resonance (SRP) from 515 to 572nm. Au nanorods are available with diameter ranging from 10 to 50 nm with aspect ratio from 1.9 to 17.9, whose peak SRP covers from visible to near infrared. Nanopartz provides Au nanorods with the largest selection of axial diameter, aspect ratio and peak SPR amongst all distributors. Ntracker™ and Ntherapy™ from Nanopartz are specifically developed for use in in vivo imaging. MSCs tracking with photoacoustic imaging: (A) Once MSCs are loaded with Au NPs, the labeled MSCs are entrapped in the PEGylated fibrin gels and implanted at the ischemic region. The PEGylated fibrin gels promote MSC differentiation toward a vascular cell type, thus contributing to regeneration. Both MSC distribution and neovascularization can be monitored using the combined ultrasound and photoacoustic imaging of cells loaded with Au NPs. (B,C) In vivo monitoring of Au NP labeled MSCs using photoacoustic imaging. (B) In vivo Photoacoustic images of the lateral gastrocnemius (LGAS) of an anesthetized Lewis rat in which PEGylated fibrin gel containing Au NT loaded MSCs was injected. PEGylated fibrin gel location is outlined with yellow dotted circle. Injection depth was about 5 mm under the skin. (C) Control at the region of the LGAS of the other hind limb without any injection. Photoacoustic images were acquired at the wavelength of 760 nm with a fluence of 11 mJ/cm2. (Reprinted and adapted with permission from PLOS, reference 27). Commercial Au NPs and Au nanorods. So far, we have summarized the existing commercial NPs which could act as contrast agents of three commonly used modalities (namely fluorescent imaging, MRI and photoacoustic imaging) for labeling and tracking of stem cells. Amongst them, SPIOs as MRI contrast agents have the longest history of commercialization and use in cell labeling and in vivo tracking. Commercial fluorescent NPs, such as QDs, fluorescent polymer NPs and fluorescent silica NPs, have undergone an exciting development in the past decade. In particular, the commercialization of QDs was a huge success. Research of using QDs in stem cell therapy is extensively investigated. However, the cytotoxicity of QDs is still controversial. Fluorescent silica NPs can be a biocompatible alternative of quantum dots. Products of Au NPs and Au nanorods have been commercialized for many years, although their application in labeling and tracking stem cell is recently found. With the rapid development of nanotechnology in stem cell therapy, the list of commercial NP products will quickly expand. Despite these successes and great potentials, concerns exist for these commercial NPs, including cytotoxicity, signal loss in longitudinal tracking during stem cell division and proliferation, insufficiency of single modality NPs to attain comprehensive information of cells post transplantation, and limited capability to report cell functionality and viability. It is critical to address these questions before they are formally used in clinic treatments. No NP has been approved by FDA for the purpose of labeling and tracking stem cells in the therapy as of yet. Prior to their usage in the clinics, it is necessary to fully characterize their effects on stem cells (i.e. cytotoxicity), including the viability, differentiation, migration/homing, distribution, and engraftment. It is challenge because the cytotoxicity of NPs depends on many parameters such as NP composition, shape, size, concentration, and surface functional groups.99 For example, the most intensively studied SPIOs are generally considered as non-toxic,99 but poly-L-lysine labeled SPIOs could impair the osteogenic and chondrogenic differentiation potentials of MSCs.100. Due to the complexity of the subject matter, sometimes, reports are contradictory to each other.89,100 Ramaswamy etc reported successful labeling MSCs using Feridex® without impair cell chondrogensis differentiation,101 while Bulte etc reported that chondrogenic differentiation of MSCs is inhibited after labeling with Feridex®.102 Therefore, during our investigation, we should be careful, cautious, and sensitive to other's reports. Longitudinal tracking is important to study the efficiency of stem cell therapy and stem cell engraftment level. One issue of using NP for long term stem cell tracking is the signal loss resulted from cell division and exocytosis,3, 104, 105 which limits the application of NPs in stem cell therapy. One possible solution is to develop new products with strong signal which provide detectable signal after multiple cell divisions. Single particle detection in single cell should open up new possibilities for cellular imaging and guide the development of new products.33, 106 In the case of single particle single cell detection, after multiple cell divisions one stem cell contains only one single particle whose signal should still be sufficient for detection. Xu etc demonstrated the possibility of single particle single cell detection for stem cell therapy. Biodegradable poly(lactide-co-glycolide) microparticles encapsulating multiple 10nm iron oxide NPs (Iron oxide/PLGA-Micro particles, 0.4-3 μm) in MSCs enhances MR parameters such as the R2 relaxivity (5-fold), residence time inside the cells (3-fold) and R2 signal (2-fold) compared to 10nm iron oxide NPs alone.25 MRI signal is still detectable in MSCs labeled with iron oxide/PLGA-Micro particles up to 12 days, while minimal signal can be detected in MSCs labeled with 10nm iron oxide NPs.33 Micro-complex encapsulating multiple copies of SPIOs may become a new type of product of MRI contrast agent which provides high resistance to signal dilution and would advance the use of NP for long term tracking of stem cells. No existing single modality is sufficient to attain all necessary information of transplanted cells.107 Optical imaging has high sensitivity but limit to low resolution and low tissue depth penetration.107 MRI has excellent resolution and no limit to tissue depth penetration but suffers from low sensitivity.107 Nuclear imaging techniques such as positron emission tomography (PET) and single-photon emission computed tomography (SPECT) have high sensitivity, no limit to tissue penetration but poor resolution.3, 107, 108 It is challenge to assess information of transplanted cells using single modality NPs. The combination of multiple modalities may provide solution to overcome the limitations of individual technique. For instance, combination of fluorescence and MRI techniques offer high sensitivity, high resolution and deep tissue penetration for labeling and tracking of cells. Several multimodal NP products are already available. Existing fluorescent and MRI dual NP products include Molday™ Rhodamine (BioPAL), iron oxide NPs with Rhodamine B (Ocean nanotech), nano-screen MAG (Chemicell). For other combinations of modalities, such as fluorescent and photoacoustic dual NPs, there is the In Vivo Plasmonic Fluorophores™ AuNPs (Nanopartz). Many other multimodal NPs are not yet commercialized but have been produced at lab scales.26, 69, 109-112 Although it is still at the nascent stages of the commercialization of multimodal products, the new products will provide solution for the specific limitations of single modality products and attract exceeding interests from consumers. Currently NPs can only provide temporal-spatial information and location of stem cells post tranplantation.3 It would be significant to report the viability, differentiation, and even cell functions.3, 113 One idea is to design a smart NP with sensors, which detects stimuli associated with cell viability and functions.114 The stimuli includes chemicals secreted during cell differentiation, physical contact with neighboring cells during stem cell engraftment, intercellular pH changes during cell death, and certain moleculesin the cell microenvironment that trigger stem cell differentiation.115 The identified molecular sensors will be conjugated to NPs. The interaction between the sensors and the stimuli generates detectable changes of signal in the NPs that can be captured by imaging modalities such as fluorescence or MRI. Presently NPs which can report cell viability and functions are at research and development stage and are only produced in research laboratories. No commercial NP with such capacity is available as of date. It remains challenging and takes years to develop smart NPs with reporting capacity and turn them into practical products. However, the generation of new smart NP products with a more thorough understanding of cell viability and functions will greatly improve the applicability of NPs in stem cell tracking and provide guidance for improvement of stem cell therapy. We summarize existing commercial NPs which can act as contrast agents for three commonly used imaging modalities for stem cell labeling and tracking. We overviewed the technology, current market status and their applications in stem cell labeling and tracking. We also discussed the concerns and limitations of existing commercial NPs and provide perspectives for the development of future NP products for stem cell therapy. Prior to the extensive use of commercial NP in stem cell therapy in humans, concerns of NPs including the unclear safety profile, signal loss in longitudinal tracking, insufficient to attain all necessary information of transplanted cells for single modality NPs and limited capability to report cell functionality and viability will have to be clearly resolved. Careful investigation of NPs effects on stem cells must be carried out prior to apply NPs in clinical trials. Micro-complex particle encapsulating multiple copies of NPs, which provides high resistance to signal dilution, can be a promising new type of product for longitudinal tracking. Multimodal NPs could out-perform single modality NPs and provide solution to attain more comprehensive information of transplanted cells. Smart NPs which can report the viability, differentiation, and cell functions would greatly advance future stem cell therapy. We thank BioPAL Inc, MacroSpheres-MicroSpheres Inc and Chemicell Inc for providing products information. This work was supported in part by Nanyang Technological University start up Grant to XCJ. Hooisweng Ow is a Co-founder and shareholder of Hybrid Silica Technologies. 16. Cappello J. Overview of Nanotechnology: Risks, Initiatives and Standardization. The American society of safety Engineers. Corresponding authors: Email: yaqiwcom, cjxuedu.sg.